Die Bergkelder hosts weekly wine tastings on Wednesdays where handmade salted morsels meld with superb hands-off, naturally crafted wines. 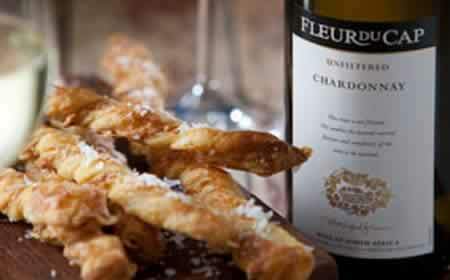 Fleur du Cap�s close affinity to nature inspired Chef Craig Cormack to create savoury treats to pair with these wines. The unique flavours of naturally occurring, ancient salts are a natural fit for Fleur du Cap wines crafted in a style determined by the grapes themselves. �One of the challenges when pairing salt and wine is to create food that will enhance the wine without dominating it. The natural process of making Fleur du Cap Unfiltered wines works particularly well with unrefined, artisanal salts, reverting back to nature in both the food and the wine,� says Craig. The unique weekly savoury parings on offer at Die Bergkelder include five Fleur du Cap wines: Fleur du Cap Unfiltered Viognier is paired with golden cheese straws encrusted with flaked Khoisan sea salt from the West Coast. Fleur du Cap Unfiltered Chardonnay is paired with olives preserved with Black Lava Salt from the lava pools of Hawaii. For an explosive taste sensation, Fleur du Cap Unfiltered Sauvignon Blanc is partnered with popcorn drizzled in Pakistani volcanic salt. Fleur du Cap Unfiltered Merlot combined with classic sweet melon and Parma ham with a pinch of Persian Blue salt is a sublime pairing. To round off this unique tasting experience, the Platter 5-Star Fleur du Cap Noble Late Harvest is paired with decadent chocolate tart finished off with delicately pink Murray River Sea salt. Tastings start at 12h00 every Wednesday from 3 October 2012 and cost R80 per person. Places are limited and booking is essential. Call Karine Retief on Tel: 021 809 8225.